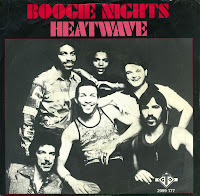 'Boogie nights' was released in 1976 as the debut single by British band Heatwave. The band consiseted of Americans Johnnie Wilder and Keith Wilder, Spaniard Mario Mantese, Czechoslovakian Ernest Berger, Jamaican Eric Johns plus British members Rod Temperton and Roy Carter. The song became their signature song, peaking at number 2 in the UK and America, and number 17 in the Neherlands.